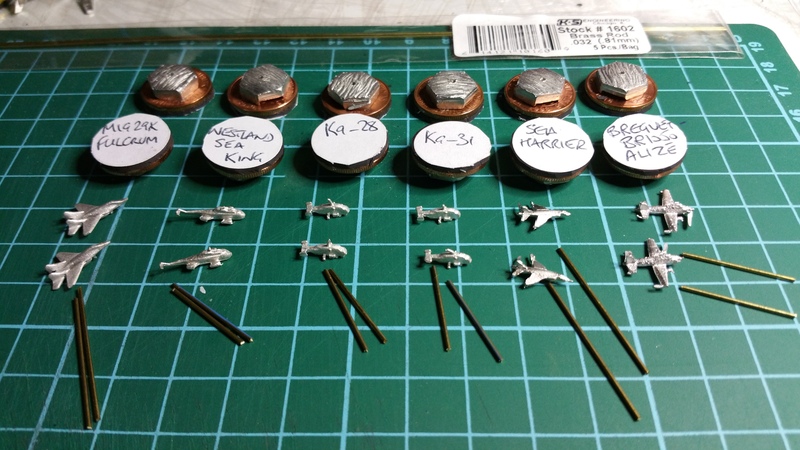 I managed to get some more time at the work table Sunday and decided that as I was progressing well with the 1/1200th aircraft, I should get the first batch based and ready for painting. 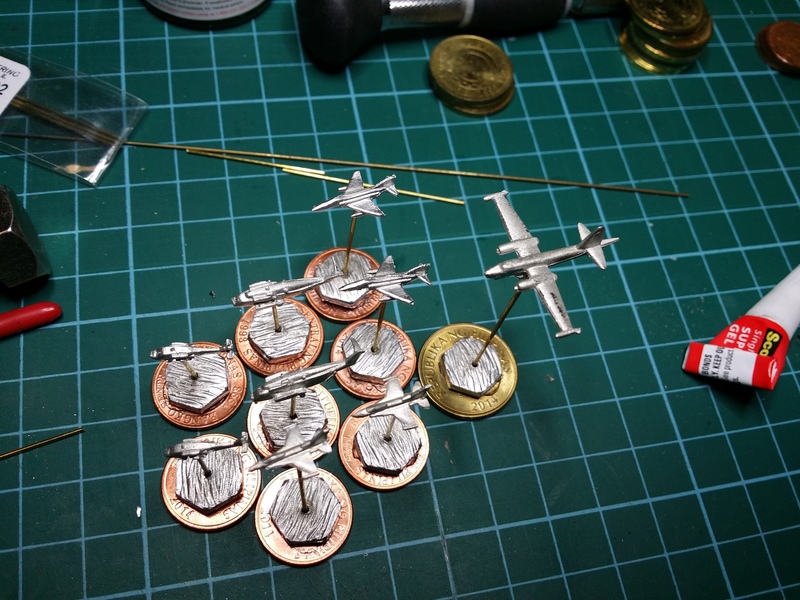 The photo to the right shows the three air fleets, such as they are, ready for painting. I am planning on painting next weekend, social engagements permitting. At the rear, the Japanese, the Chinese to the fore and the Indians off to the left. The Indians are shown to the left. Two maritime patrol aircraft – an Ilyushin Il-28 and a Tupolev Tu-142 Bear – which I finally got to stand on a base. Also present are the Ka-28 and Ka-31, and the Sea King helicopters. The Sea Harriers, MiG-29K and Breguet BR1050 Alizes round out that little force. To the right are the Chinese aircraft. Ka-28 and Ka-31 helicopters provide the ‘copters carried by the Chinese naval vessels. A Tu-26 Badger provides maritime patrol. For some aerial punch there are some MiG-21s in the guise of Chengdu J-7s, Sukhoi Su-30s and Shenyang J-15s. 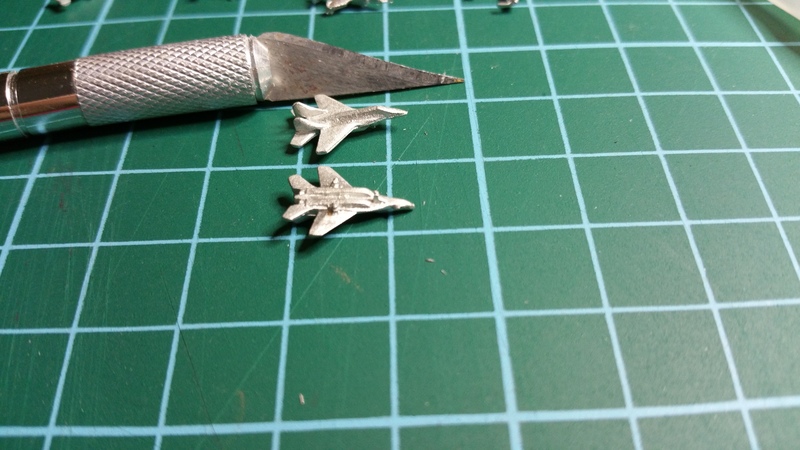 The MiG-21 is small relative to the later aircraft and is modelled with no fuselage under the wing level which is not quite right, however, at 1/1200th scale, I don’t have any rivets to count and for wargaming purposes, it looks like a J-7. Lastly, the Japanese. As the Chinese have taken Russian designed aircraft and localised them to Chinese requirements, so the Japanese have been building American aircraft under license. For maritime patrol the Japanese have a Kawasaki P-2J (a licensed version of the Lockheed Neptune). Helicopters are Sikorsky Super Stallions and a local version of a Sikorsky Sea Hawk, the Mitsubishi H-60. For some punch there are a couple of older F-4 Phantoms and some newer Mitsubishi F-2s. Of course, being a wargamer, it is too difficult to pass up the opportunity of having a couple of Phantoms bounce a couple of MiG-21s. However it seems like one of the MiGs has managed to get itself a firing solution whilst the wing man to the Phantom hopes his leader will get a hurry on and get a firing solution on the other MiG. Lastly, something a little more modern. OK, enough playing. 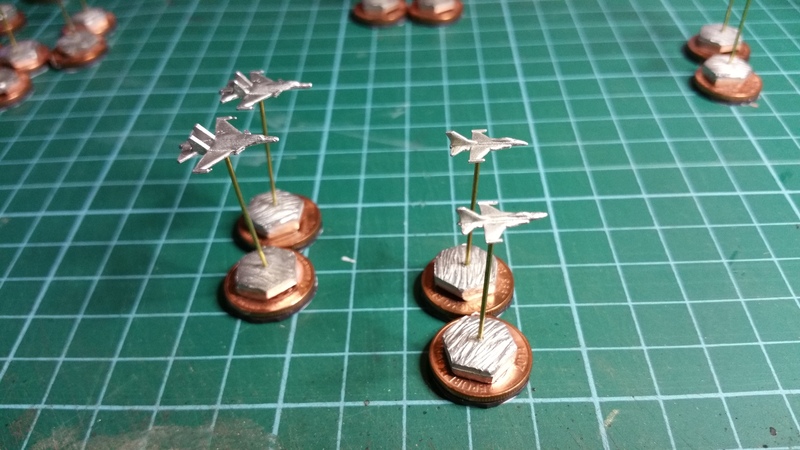 Next step with these is to undercoat next weekend when I hope to finally try out my new air brush. 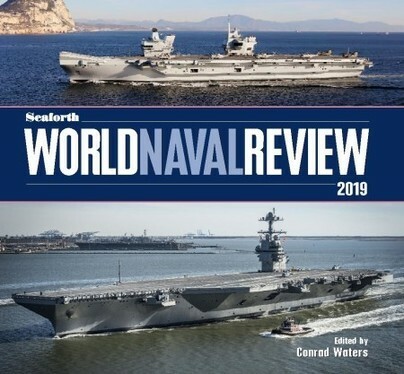 I mentioned previously my modern fleets (Chinese, Indian and Japanese) built from Navwar vessels. 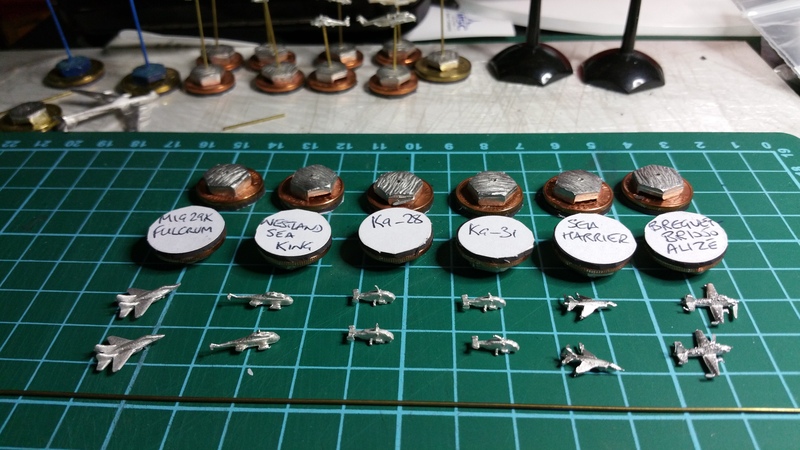 I also mentioned before that I was putting together some Cap Aero 1/1200th scale aircraft from Magister Militum to go along with the vessels. 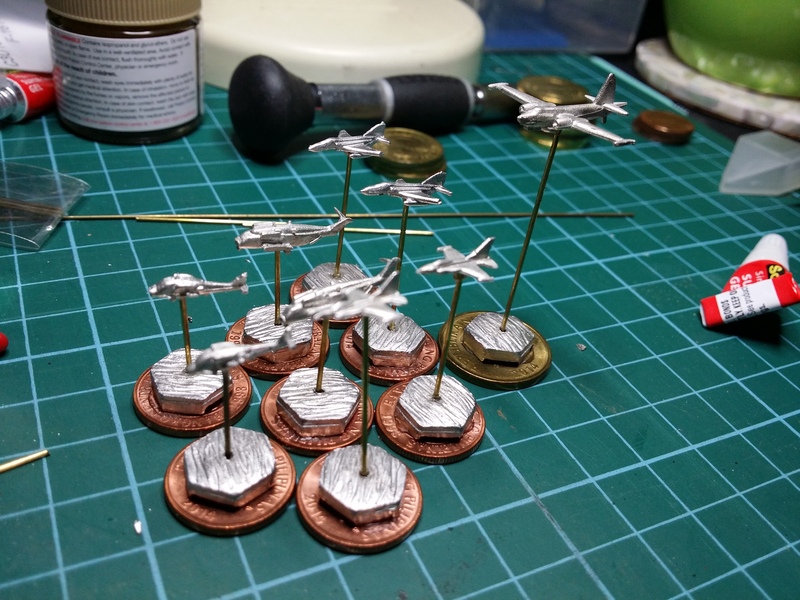 I had set the Japanese aircraft up, but have not got around to painting them yet. I am looking at just doing two of each of the aircraft/helicopter types. I reckon I am not ready for a wing of MiG-29Ks to come sweeping across a fleet yet – two seems enough to handle at the moment. 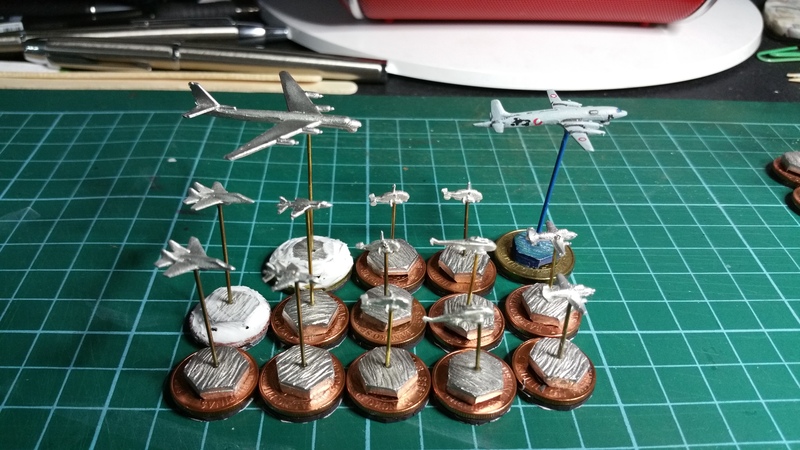 I also have an Ilyushi Il-38 May painted already for the Indians and my most troublesome model so far, a Tupolev Tu-142 Bear, also for the Indians. I say my most troublesome as this particular aircraft has more holes in it now for mounting than your average block of Swiss cheese. Still, I think I have cracked it finally. 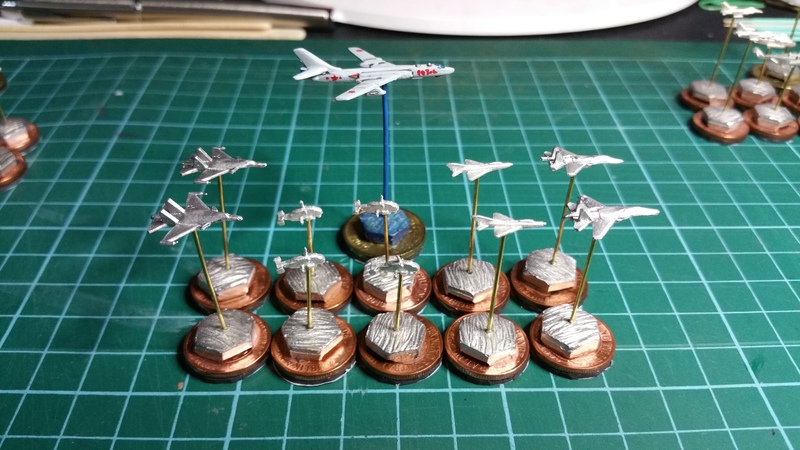 As with the Japanese I have been been using the Philippine 10-centavo and 25-centavo coins as an extra base underneath the metal bases I bought when I purchased the aircraft. The hexagonal base, whilst a good weight, is not quite wide enough for stability and the coins provide enough extra width to stabilise the model aircraft. 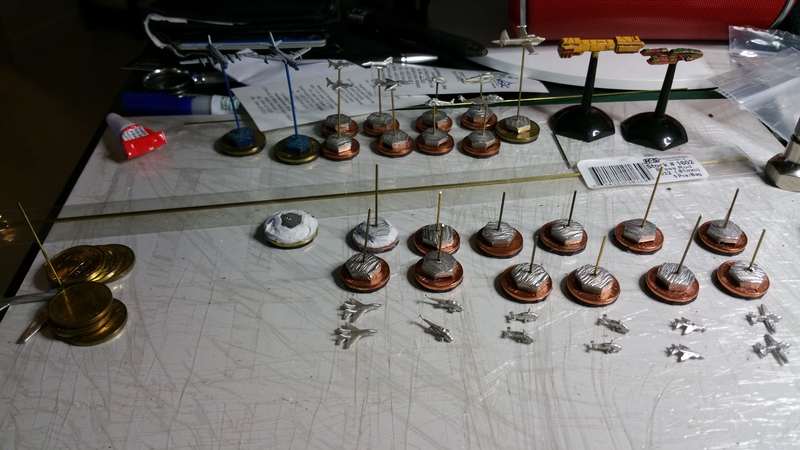 I was also looking at covering the coin on the base with some acrylic gap sealant to extend the sea base a little but that has turned out messier than originally expected so after two test bases, the idea has been dropped, leastwise until I can think of something better. Well, complete except for the aircraft. The painting method of the Navwar ships was simple. 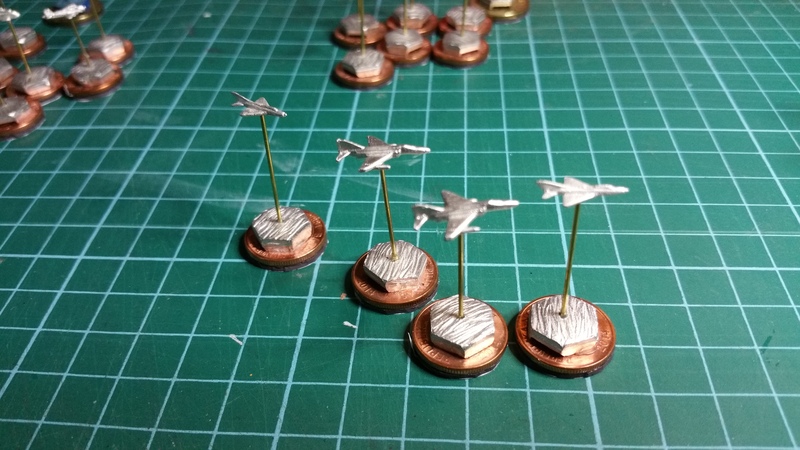 I started by cutting some 3mm thick bases to an appropriate size. Added some Woodland Scenics Flex Paste to the base. Tapped my finger across the wet flex paste to give it some texture. I then slid the ship into the paste and waited for it all to dry. I under-coated the ship and base in white. To see what I was doing, I then covered the whole ship and base in a black ink wash. The base was then painted a dark blue (use your favourite). Once that was dry, a light blue was made into a thin wash and washed across the base (and I mean thin). When dry a colour like Games Workshop’s Citadel Snot Green (or whatever it is called these days) was also made into a very thin wash and washed across the base. 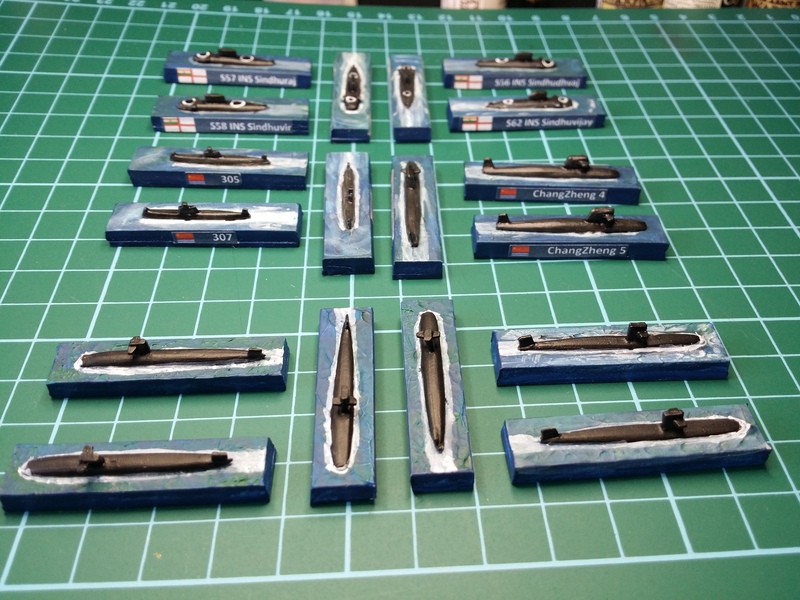 The ships were painted in Army Painter Ash Grey. I kind of use a wet/dry brush technique. Some black ink again and then a light grey touch on some of the raised detail and the vessels were painted, except for the helicopter markings on the stern. These were painted as much with a fine pen and ruler as possible however as I cannot find a yellow pen (go figure) I used Citadel’s Sun Shining out an Orc’s bottom Yellow and some careful(ish) brush work. Add some name tags, some white paint, thinned, for the ship’s wash then gloss varnish on the sea surface and satin varnish on the ship. 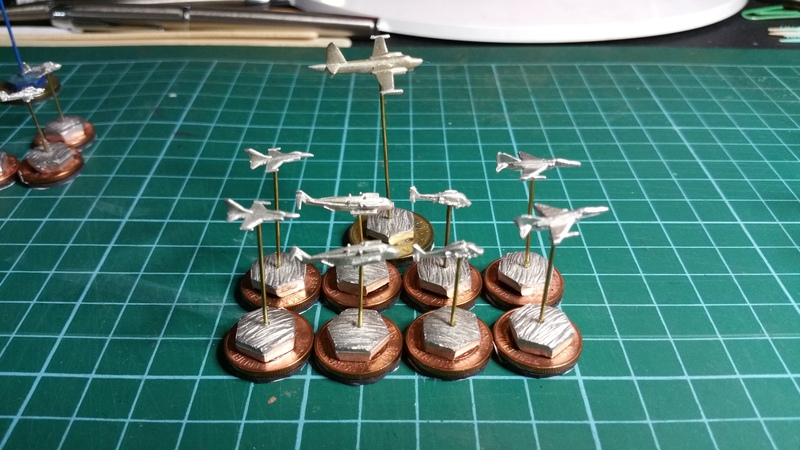 I’m quite happy with the way these have turned out, especially the simple sea bases. I will go back over the Chinese and Indians and gloss varnish the sea surface to make it more reflective. The photos below were taken with a camera and because of the light, a flash, which has kind of washed the grey out a little like a sunny Pacific Ocean day. Next for the Japanese (and Chinese and Indians) is the aircraft – but that will need to wait until I sort out some employment. 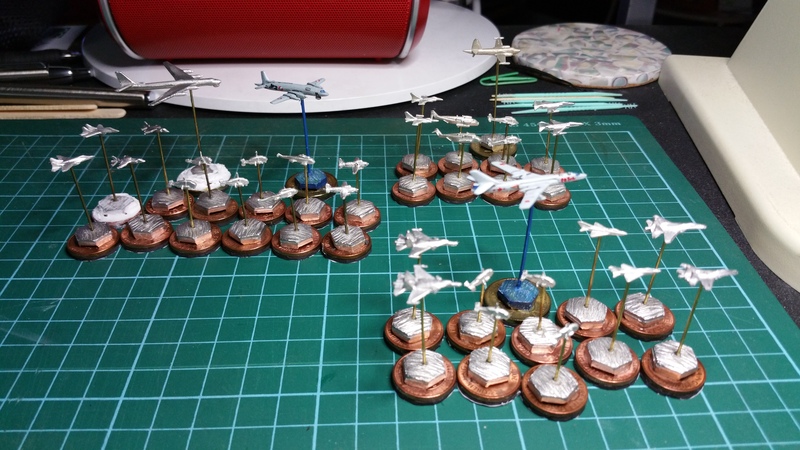 I started the modern Japanese and for this fleet I am trying a little texture on the base. I will describe the method later (as I have shamelessly stolen it from the GHQ website and a YouTube video I think – more about that later). In the meantime, Japanese to the front, Chinese in the middle and Indians bringing up the rear. 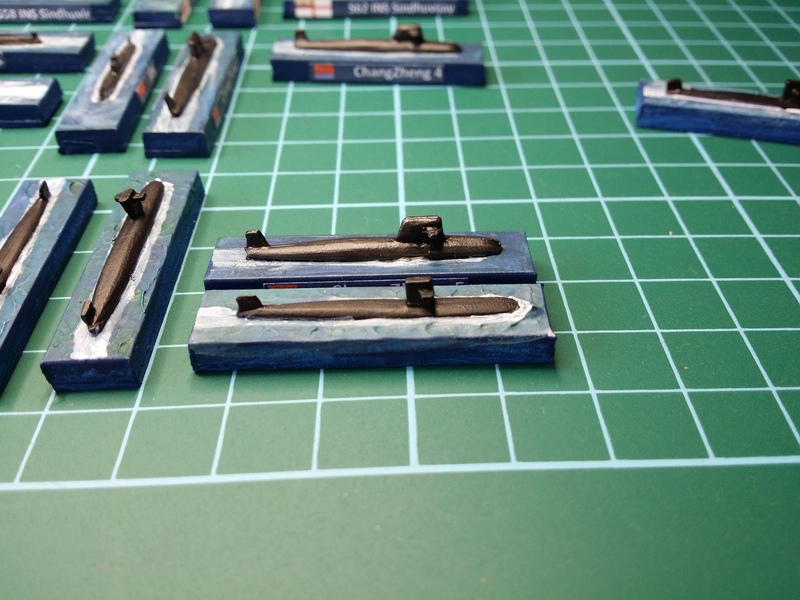 The Chinese and Indian subs are on just a plain painted base, the Japanese on a newly, slightly textured one.